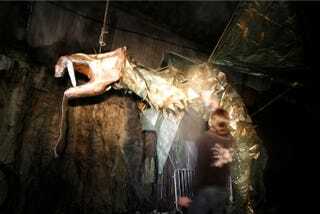 You might run into this 12-meter-long dragon and have to do that cartwheel-legged, Scooby Doo run off the premises. This sculpture was constructed by Valve, a Finnish LARPing group who built (and left) it there last month. Between this and the Wizard Quest in Wisconsin, we have a good case for building more dragons in random geographical locales.